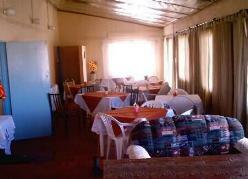 Garies Rest Camp is ideally situated on your way to the famous Sossusvlei. With en-suite bedrooms and campsites, you can stay overnight, but you may also stop just to have breakfast, lunch or a drink. The owners Kosie and Lily Mouton will spoil you with their hospitality – visit, and you will be surprised! 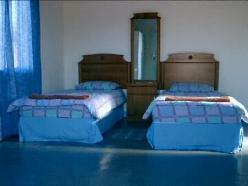 Rooms: 6 en-suite bedrooms (3 twin rooms / 2 double bed rooms / 1 family room). 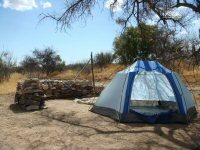 Camping 5 camp sites with braai facility and ablution block. The 4x4 drive starts by the Rest Camp and follows the canyon along the river bed, through stony and steep trails up to the hills. After an impressive tour you will reach the caves, the beautiful fountain and will be impressed by ancient rock engravings and bushman paintings. The whole tour takes approximately 6 hours, but you can also choose to hike part of the trail. For the more adventurous a bush campsite is available. 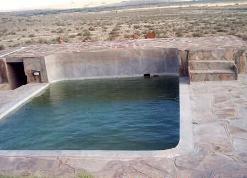 Please note that there are no facilities, so one has to be fully equipped. Horse Riding is offered to enthusiasts, even to inexperienced ones. Enjoy nature from the perspective of the saddle. A guided tour to the Rock Engravings brings you face to face with prehistory. 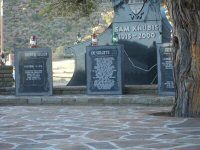 Various sites with different engravings can be visited on this tour. Sam Khubis is a historical trip guided by Kousie Mouton. The Rehoboth Basters vowed to God to celebrate Sam Kubis every year on 8 May to express gratitude for their victory over the Germans (1915). Have a fun trip on a donkey car. You will experience the authentic Namibia feeling using this traditional mode of travel. Enjoy a traditional Baster “kos” from Lily Mouton. Breakfast, Lunch or Dinner: the choice is yours. 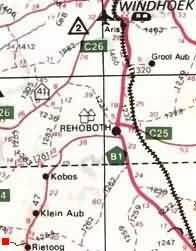 From Windhoek: take the B1, drive trough Rehoboth until the sign "Klein Aub". Turn into the C24. Pass Klein Aub until you reach a junction with the sign "Garies Rest Camp". Turn right to follow the sign. After 8 km you have reached Garies Rest Camp. From Büllsport: drive on D1206 which leads into M47. Continue through Rietoog for about 30 km, turn into the C24, turn left follow the sign. After 8 km you have reached Garies Rest Camp.